If you do what you love, youâ€™ll never work a day in your life. When you add a love of what you do to hard work and graft you can get some amazing results. Since it's Valentine's weekend we have decided to celebrate the amazing work schools have been doing on social media. It's easy to just sign up to social media and make an account. A real quality account is made when you use your social media with love and care... the results are amazing! Let's take a look at the most popular channels for schools, and some great examples. It was not easy to pick a school who excelled at Twitter! 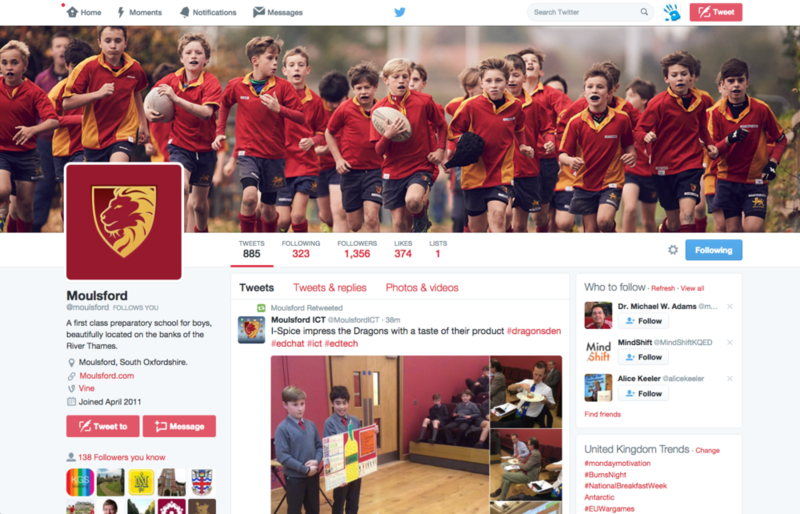 There are thousands of schools tweeting, but which ones are using it effectively? 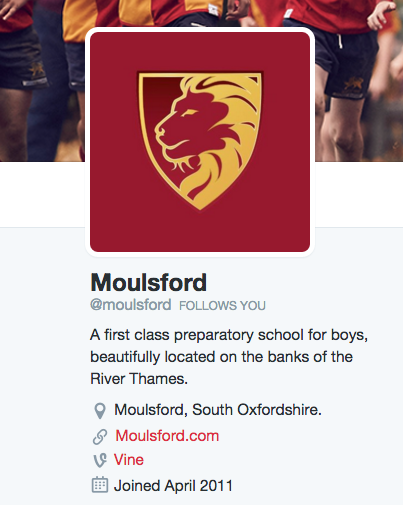 Tender for Twitter: Moulsford Preparatory School! We think it's really important that social media gives you the platform to express your schools personality. Showcasing your core brand and ethos on social media is a real skill which can only be achieved by authenticity. So why does this account feel so loved ðŸ˜�? 1. Departmental Accounts: Schools are built up of multiple departments. It is very difficult for your school to only have one voice on social and Twitter in particular. By creating departmental accounts your whole school gets a voice and teachers feel involved and get the chance to show of their own departments. 3. Sub Account Skinning: By branding your departmental accounts and giving them a unique identity it really looks professional and creative capturing the brand and ethos of the school and even captures the personality of each department. Contact our social media team for enquiries about setting up, and branding departmental accounts! 5. Content: Share great content of 'what's happening' in your school right now. There's always exciting things happening at schools - but you can't always be there. The primary focus of a schools content should be sharing great school stories. Don't get caught up in trying to jump onto irrelevant trending subject and spamming your feed with articles. Keep it simple and post with love! Facebook Pages are used to engage with your community. Building a successful Facebook Page that feels loved is very much down to making the most of the features available, sharing great stories, and being authentic. So what make Thornton's Facebook Page feel so loved? 1. Clear Posts: All posts serve a purpose and are ALWAYS driven by imagery. The text is engaging and supported by an image. Facebook can become very dull with simple text posts. Make your posts clear. Parents are the main target audience so post content to ignite parental interest. And let's be honest, they are just interested in seeing their child. 2. Using Facebook's Features: Facebook has many features to make your posts stand out and to really make your page feel loved. For example if your school has an event instead of just talking about it create a Facebook Event. Ask parents to confirm attendance on Facebook. If you have an open day, people can register their interest. And guess what... their friends will see it. #WordOfMouth. 3. Galleries: Facebook albums are fantastic for posting photos and capturing all of your school events. By uploading multiple event galleries you will start to build a quality Facebook Page, full of special memories and stories. These touches make your Facebook page really unique. 4. Lots of Information: Facebook Pages are now like a "mini-site". There is nothing much frustrating on an actual website than missing information. One piece of missing information on your Facebook page can be frustrating for the user. Make sure all information is covered. Flickr is an amazing social network and especially for schools. So many amazing stories are happening everyday within schools and capturing these stories is so important. Falling for Flickr: Hazlegrove Preparatory School! So what makes Hazlegrove's Flickr profile feel so loved? 1. Albums: With a whopping 35,000 photos it's very important that these photos are organised. There is nothing more stressful for a Flickr user than scrolling through thousands of unorganised photos. Organising 35,000 photos is really an ode to how dedicated this school have been and a fantastic example for having love and pride in your social. 2. Collections: Why not be even more organised? Hazlegrove have placed albums in collections so each album is placed under a specific event or school collection. This level of organisation and care just really emphasises the love and dedication it takes to have a fanatics social channel. 3. People love photos: The proof is in the pudding. Hazlegrove has had over 3.5 million views on their Flickr account. When content is uploaded frequently and consistently Flickr is an amazing resource for parents. Imagine knowing every event will have its own amazing album. Parents can't be at school taking photos of their children and Flickr means they don't miss out on precious memories. Sentimental for Soundcloud: The Leys School! So what makes The Ley's SoundCloud profile feel so loved? Nothing succeeds like the appearance of success. Having a professionally skinned SoundCloud page really gives your school that wow factor. Your social channels are an extension of your school. You want your school to look spectacular. Add key links and a bio. Dress your profile for success! 2. Organisation: Again, with so many wonderfully gifted students in schools you will most likely have lots and lots of content to upload. Make sure to utilise playlists to ensure people can find the content they are after with ease. A well organised and presented social channels shows real love and dedication. All audio recordings are recorded in high quality. Wouldn't it be a shame if you had a beautifully skinned social channel and all of the music was low quality? Make sure the content you upload is clear and professional to match your beautiful profiles. So what makes Bablake's Issuu profile feel so loved? 1. Populated feed: When starting off on a social channel you really need to hit the ground running. Channels with sparse feeds can appear unprofessional and are often affiliated with spam accounts. Schools have thousands of publications and PDF'S when you start using Issuu hit the ground running. 2. Stacks: Stacks are great for Issuu they organise all of your publications into categories (similar to albums on Flickr). Rather than just simply bulk uploading PDF's take care and upload your publications into designated stacks. 3. Branding: All we can see is a sea of red! This keep in line with the brand and house style of the school. Uploading an array of colourful PDF's may be a bit of an eye sore for the user. When creating your documents bare in mind the brand colours. Instagram is an online mobile photo-sharing, video-sharing, and social networking service that enables its users to take pictures and videos. Whilst Flickr creates memories and albums, Instagram is for real-time sharing engaging photo content. Infatuated for Instagram: Regents School, Bangkok. So what makes the Regents School, Bangkok Instagram profile feel so loved? 1. Variation: On Instagram you can post photos and videos. The Regents School, Bangkok has utilised third party apps such as "Layout for Instagram" to make collages. They have even created event adverts to raise awareness for school events. Variation is key to making your Instagram feed stand out from the crowd! 2. Event based imagery: Schools have hundreds even thousands of events happening every year. Base your Instagram photography around events to boost user engagement. Uploading a photo of a child in maths class will not drive as much engagement as graduation or school productions. 3. Colour and more colour: Basic colour psychology shows that as humans we are drawn to bright colours. On a solely visual social media networking service bright colourful imagery is crucial to making your school stand out. Use Instagram's photo filters to enhance your imagery and take it to that next level. Yearning for YouTube: The British School in the Netherlands! So what makes the British School in the Netherlands YouTube channel feel so loved? 1. Playlists: Creating a playlist takes seconds and really revitalises the look of your YouTube channel. Videos become organised and are easily accessible for the user. If you only have one or two YouTube videos playlists aren't essential but after several videos playlists are a must to enhance the users experience. Varietyâ€™s the very spice of life, that gives it all itâ€™s flavour. Like on many other social channels once again variety is crucial. Being a school Youtube page your target audience is most likely existing and prospective parents. It's important to vary your uploads for your target audiences. As well as documenting school stories, try creating fun marketing videos for prospective parents. Vary video lengths and try fun videos. 3. Being thorough: It's shocking how much of an impact leaving out key information on YouTube can have. Choosing categories for your videos and making sure each and every video has a detailed description is crucial to having a professional YouTube channel. Your YouTube channel is an extension of your school... take pride in it! Pinterest is a blank canvas, a bulletin board. Within boards users can pin images, videos, and other resources creating a collage. Pinterest is a great way to showcase the creative arts in your school. Why not read more about Pinterest in our Creative Arts on Pinterest blog? Passionate for Pinterest: Bedford Girls' School! So what makes the Bedford Girl's school Pinterest channel feel so loved? 1. Clear channel message: Pinterest is a very creative channel. It can be used for a variety of reasons. Bedford have chosen a clear direction which is solely uploading original content for a number of departments. This account is very organised and serves a clear purpose. Many schools are perhaps afraid of taking their first steps in using Pinterest but having a clear plan like Bedford will make your account a successful one. 2. Get pupils involved: When you do share ideas and other peoples content on Pinterest make it very relevant. Bedford have a "Eco Club Make Ideas" board. Here ideas are shared from around the web so members of the eco club can share great ideas on what 'green'' products they can create in class. Set up relevant boards for different creative clubs and classes to share great ideas. 3. Organisation: Keeping your boards up to date and relevant to your content makes your page much more user friendly. Make sure all content is placed within a board and that the board subject is relevant. 'Succeeding' at social media is really just about loving and caring about your social channels. That extra little attention to detail can turn your social media channel from a good account to a great one. We would love to hear any thought or comments your have below about loving your social accounts!